The Truth and Reconciliation Commission was established in 2008 to document the experiences of residential school Survivors before, during and after their time in residential schools and to lay the foundation for a new relationship based on mutual respect and understanding in Canada. Following former prime minister Stephen Harper’s 2008 apology for residential schools, three commissioners were named to lead the TRC: Justice Harry LaForme, Jane Brewin Morley and Claudette Dumont-Smith. All three resigned shortly after the commission started its work. In 2009, a new chair, Justice Murray Sinclair (later Sen. Murray Sinclair), and two new commissioners, Chief Wilton Littlechild and Marie Wilson, were appointed to take over. Between 2009 and 2015, the Truth and Reconciliation Commission held hundreds of hearings and community events across the country. Four-day national events were held in Winnipeg, Inuvik, N.W.T., Halifax, Saskatoon, Montreal, Vancouver and Edmonton, with large regional events occurring in Whitehorse and Victoria. Hundreds of thousands of people attended these events and hearings with many more watching via live webcast. The commission recorded close to 7,000 statements during its mandate and amassed a collection of approximately five million documents from government and church archives. Murray Sinclair, chair of the Truth and Reconciliation Commission, delivers the commission’s final report in Ottawa on June 2, 2015. The official closing ceremonies of the TRC occurred in early June 2015. 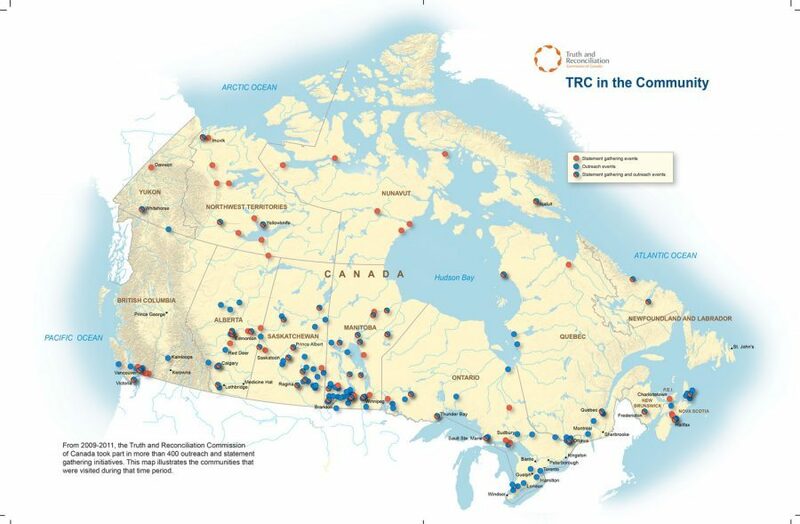 Here, the TRC released summary reports in addition to its 94 Calls to Action. The full report totalling seven volumes of material was released in December 2015, with the commission officially closing its doors immediately thereafter. This seven-volume final report detailed the manner in which the residential school system has directly impacted the lives of Indigenous Peoples in countless ways and directly contributed to the vastly unequal representation of Indigenous Peoples in the correctional, child welfare, justice and health care systems. These reports also detailed the unique experiences and harms inflicted on First Nations, Métis, and Inuit Survivors and communities. During the closing events of the Truth and Reconciliation Commission, the National Centre for Truth and Reconciliation was opening its doors. Special ceremonies were conducted with Elders from the NCTR and TRC during the Ottawa closing event acknowledging the birth of the NCTR. Elders described the NCTR as the child born out of the IRSSA and implored all to acknowledge that it takes a community to raise a child. Ceremonial songs were sung acknowledging the birth of this child of the settlement agreement. The NCTR officially opened its doors in early November 2015, marking the first time some of the records collected by the Truth and Reconciliation Commission were made available to Survivors, their families and the broader Canadian public. In the report, Survivors noted how Canada’s broader colonial history, not just the legacy of the residential schools, has affected, and still affects Indigenous communities — including the over-representation of Indigenous children in the foster care system and of adults in Canadian jails and prisons, the inferior education and health care in Indigenous communities, the lack of land and water rights, and the growing number of murdered and missing Indigenous women and girls. From 2009 to 2011, the Truth and Reconciliation Commission took part in more than 400 outreach and statement gathering initiatives. This map illustrates the communities that were visited during that period. Throughout the TRC’s work, the process of healing and reconciliation evolved. Thousands of Canadians began to understand the depth of harm imposed on Indigenous Peoples and were inspired to take action to right past wrongs. Following the release of the TRC’s 94 Calls to Action, governments, organizations, corporations, churches and countless community groups started taking on new policies, projects and plans with the goal of mending the broken relationship between Indigenous and non-Indigenous people, communities and organizations. While there are many achievements to be celebrated, the hard work of reconciliation and structural reform necessary to transition this country into a respectful and safe place for Indigenous Peoples will take years. This presents a deep challenge for this nation — while the big work of changing the nature of our relationship at a structural level continues to evolve, the many forms of crisis experienced within Indigenous communities continues to rage. Children continue to be disproportionately represented in the child welfare system, suicide remains at epidemic levels in certain communities and Indigenous Peoples continue to experience a lesser quality of life than non-Indigenous people. 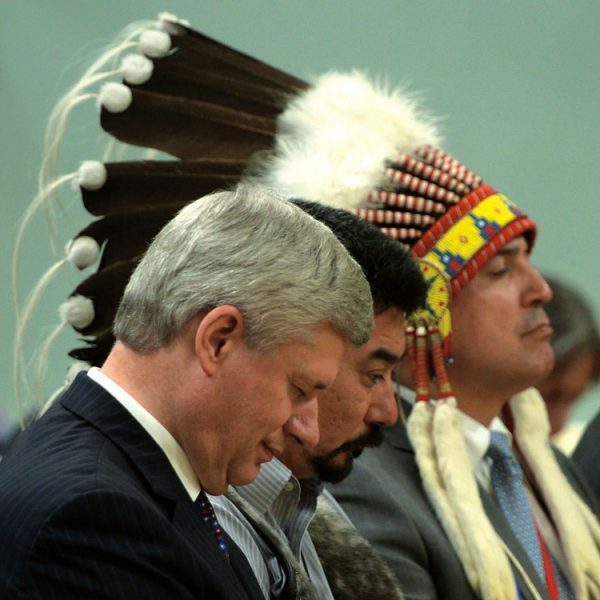 Prime Minister Stephen Harper, Inuit Tapiriit Kanatami president Terry Audla (middle), and Assembly of First Nations Chief Perry Bellegarde at the closing ceremony of the Truth and Reconciliation Commission, on June 3, 2015. Given the long history of broken promises and false hope, it remains difficult for many Indigenous communities to trust that meaningful change will occur. Sadly, the past history of Canada is littered with many aspirational ideas but little transformative change. Reconciliation remains a massively complex exercise for this nation — one with great depths that many are only beginning to understand. Significant reform in the areas of law, legislation and justice must all occur. Likewise, deeply held racist conceptions of Indigenous Peoples must also be eliminated from society. All Canadians have been called upon to embrace this work, and each is asked to contribute to the overall work of reconciliation. Reconciliation in this context is not just about acknowledging that residential schools occurred and that they created harm. It calls upon all Canadians to recognize the ideas and structures that created the residential schools in the first place, and to rise against these outdated and deeply oppressive ways of thinking. Reconciliation in this regard is about establishing and maintaining respectful relationships. It acknowledges that we do not yet live as a society that is based on mutual respect and understanding. We live in a manner that is profoundly disrespectful to the environment and land, to Indigenous Peoples, and to the idea of true equality. Through the 94 Calls to Action, the 10 Principles of Reconciliation and the United Nations Declaration on the Rights of Indigenous Peoples, the Truth and Reconciliation Commission has provided a roadmap to transform this country into a place based on true principles of respect, equality and justice — in short, a better, richer and healthier country for all forms of life. In the creation of this better society, it is important for Canadians to remember the tragic legacy of residential schools and to acknowledge the long-lasting effects of this dark aspect of Canada’s identity. Canada is not just simply moving towards a brighter future; it is fundamentally moving away from a horrific and systemic past and present of cultural genocide and mass oppression of Indigenous Peoples.